Although Visual Basic 2019 is a programming language designed for creating business and other industrial applications, it can be used to create animation. In the preceding lesson, we have actually learned how to create animation using the timer. In fact, the programs we have created in the previous lesson such as the stopwatch and the digital dice are animated programs. In this lesson, we shall show you more advanced animated programs. We can create a moving object using the timer. The motion can be from left to right or from top to bottom motion or diagonal. First, insert a picture box into the form. In the picture box properties window, select the image property and click to import an image in your storage devices such as your hard drive. We have inserted an image of a bunch of grapes. Next, insert the Timer control into the form and set its Interval property to 100, which is equivalent to 0.1 seconds. 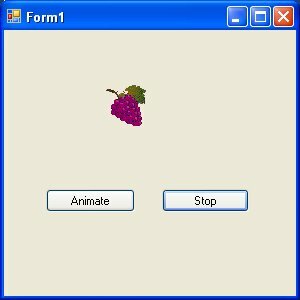 Finally, add two buttons to the form, name one of them as AnimateBtn and the other one as StopBtn, and change to caption to Animate and Stop respectively. In preceding lessons, we have learned how to create graphics and draw objects on the form. Now we shall use the previous knowledge to create an animated graphical dice using the timer. In this program, we need to insert a timer and set its interval to 100, which means the drawings will refresh every 0.1 seconds. 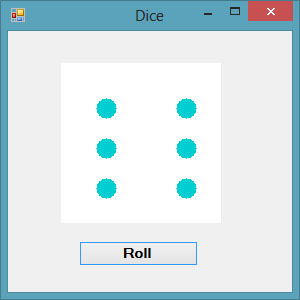 Next, insert a picture box which is used as the surface of a dice. Finally, add a button and change its text to Roll . Under the Timer sub procedure, we create the Graphics object and the Pen object following the procedures we have learned in preceding lessons. Next, we use a Do loop and the Select Case structure to cycle through all six surfaces of the dice. To create six random cases, we use the syntax n = Int(6 * Rnd()) + 1. We can stop the loop by introducing a variable t and the loop until condition. The condition we set here is t>1000, you can use any figure you wish. In this program, we add three picture boxes, a timer, a button and a label. Set the timer interval to 10, which means the images will refresh every 0.01 second. In the code, we shall introduce four variables m,a, b and c, where m is used to stop the timer and a,b,c are used to generate random images using the syntax Int(1 + Rnd() * 3). To load the images, we use the following syntax: PictureBox.Image = Image.FromFile(Path of the image file) We employ the If...Then structure to control the timer and the Select Case.....End Select structure to generate random images. The label is used to display the message of the outcomes. LblMsg.Text = "Good Luck! 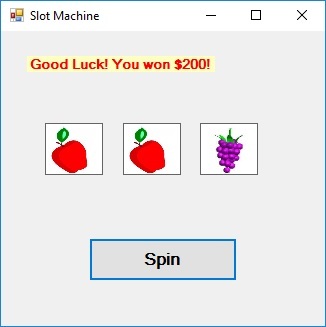 You won $200!" LblMsg.Text = "Good Luck! You won $500!" LblMsg.Text = "Good Luck! You won $1000!" LblMsg.Text = “Jackpot! You won $1,000,000!"